Do asylum-seekers and traffickers consult newspapers before they set off? Denmark’s Minister for Foreigners, Integration and Housing Inger Stoejberg seems to think so, and wants to make sure that nobody contemplating applying in Denmark is under any illusions about the state of the current Danish asylum policy. To this end, ads ran this week in four Lebanese newspapers, including The Daily Star and Assafir, explaining the Danish government’s halving of asylum-seekers’ benefits and detailing new and tighter measures. Asylum-seekers whose claims have been temporarily approved will have to wait a year for family reunification, and asylum-seekers whose applications have been rejected will be forced to leave the country as soon as possible. 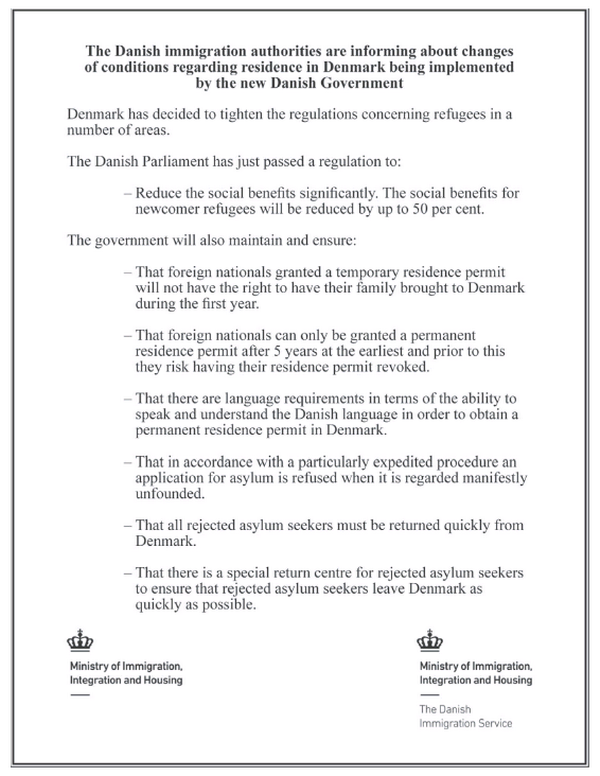 The Danish Ministry of Immigration, Integration and Housing's advertisement aimed at refugees. The ads are the brain-child of the controversial Stoejberg, and they have been roundly criticized from all corners since July when the minister announced her intentions to run them. Det, der desværre ofte står tilbage efter flygtningedebatten, er, at vi danskere ikke kan lide fremmede. De ser anderledes ud, de tænker anderledes, de kan ikke integreres. Alt det der. Det påvirker vores ry og også muligheder for at tiltrække kvalificeret arbejdskraft. Hvem vil flytte til Danmark, hvis man ikke føler sig velkommen? Unfortunately what is left standing after the immigration debate is that we Danes don’t like foreigners. They look different, they think differently, they cannot integrate. All that stuff. This affects our reputation and also our ability to attract qualified workers. Who’ll want to move to Denmark if they won’t feel welcome? 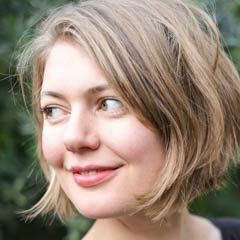 However, the most creative and efficient response came not from powerful industry groups or the well-established NGOs that Denmark abounds with, but from regular Danes on social media. Ordinary Danes have responded nimbly online, using social media to greater effect than the minister and her taxpayer-funded advertising budget. Der er forskellige lag, om du vil, i kampagnen. Det handler om at sætte en dagsorden. At vi skal italesætte hvordan vi taler til og om flygtninge. Derudover tror vi næppe en person på flugt fra bomber har overskud til at sætte sig grundigt ind i avisannoncer – hvilket vi forsøger at adressere – at præmissen for Støjbergs skræmmekampagne er forfejlet. There are various layers in our campaign. It's about setting the agenda — we want to talk about how we talk to and about refugees. We don't think a person fleeing bombs necessarily has the opportunity to carefully parse newspaper ads, which is something we also try to highlight, that the premise for [Inger] Støjberg's ads is incorrect. So far, the ads have run in the Guardian and the German Tageszeitung, with more planned if funds allow. The Welcome Refugees ads have given the government ad campaign a run for its money, highlighting to the rest of the world a grassroots disagreement with the official government line. 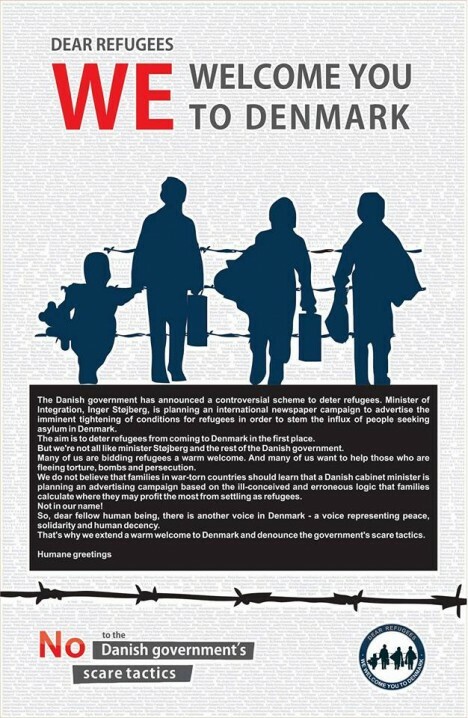 “Dear refugees, we welcome you to Denmark” advertisement. The timing of both ad campaigns could not be more poignant. As the Middle East and parts of Africa are roiled by a refugee crisis of a proportion not seen since the WWII, politicians in Europe are grappling with how to respond. In Denmark, this has meant a tightening of asylum policies, with support from across the political spectrum in the last three governments. Denmark has opted out of the European framework agreement for resettling refugees, and the influential Danish People’s Party, which provides the parliamentary majority to the government without formally joining it, wants to leave the Schengen agreement, which allows for passport-free movement between member countries. 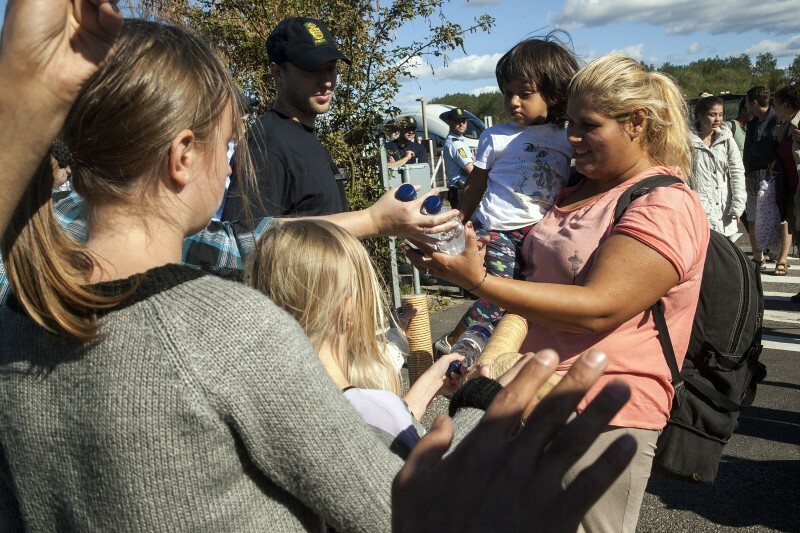 However, the last couple of weeks have seen a public groundswell of support for refugees, reflecting a larger trend in Europe, where Germans and Icelanders are opening their homes to host refugee families, showing up with water, food and balloons at train stations, and Danes picking up the slack from major relief organizations by going to the Greek island of Lesbos with a container full of supplies. Whether or not people fleeing in desperate circumstances can take the time to sit down and read newspaper ads and Facebook posts, carefully compare rates of allowances and then have the means and power to pick and choose a trafficker who will reliably shepherd them to their chosen destination is doubtful. Research indicates that the level of allowances given in each destination country plays a minor role for asylum-seekers. But the symbolic signal that the two dueling ad campaigns send are heard loud and clear in Denmark. They are part of a larger battle of values, playing out in European train stations, private homes and social media right now. Perhaps the implications of huge numbers of immigrants has not been appreciated by the citizens of Denmark. It will be their taxes, schools, work places, all social settings that will be impacted by the huge number of immigrants. And what will they think when Denmark has 12 official languages like South Africa? Even here in south Texas if you don’t speak and read and write Spanish you might as well not go visit.